Fondi has an ancient history. According to the legend, it would have been founded by Hercules in memory of the killing of Cacus. The importance of Fondi lies in its position across the old Via Apiia, began in 312BC, which was far for more than two millennia the main roadway from Rome to southern Italy. In 1140 Fondi passed to Dell'Aquila family to the powerful Caetani barons who made it for two centuries the centre of their power, and a centre of artistical development as well. In 1378 the powerful Count Ornorato I Caetani summonded here the conclave in which the cardinals elected Clemet VII against the legitimate Urban VI. The Caetani lost Fondi after Charles VIII of France's expedition to southern Italy, and it was assigned to the condottiero Prospero Colonna. Under the Colonna the city met another period of artistical and cultural splendor, thanks to the court held by Giulia, who lived in Fondi between 1526 and 1534. Fondi' main sights include: The Castle, with a characteristical round tower standing up to more than 30 meters, symbol of the city. The adiacent Palazzo Principe, constructed in 1466-1477 and attribuited to the Catalan architect Matteo Forcimanya. The Cathedral of St.Peter built over a roman edifice, identified as a temple of Jupiter. The Collegiata of Santa Maria Assunta preceded by a wide staircase and built in the 15th century by Onorato II Caetani. 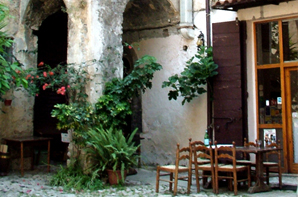 In the old city centre is the Jewish district, the Giudea. In the near countryside the magnificient San Magno, where on the top there is a sanctuary where people go on pilgrimage. Here enzo simonelli has relaxing started his job since 1982. His wife maria loreta is always in the kitchen. Their three sons at the university. Enzo seems to be a quiet person. He has been preparing coffee since he was 8 years old on the no longer existing bar’s desk. When he was 16, he worked as waiter in germany, than mess hall co-owner into an us military base in stuttgart. (i have seen many things… wounded soldiers who came back from vietnam). Afterwards a quick stay in venezuela. Back home, he transformed a garage into a restaurant which looks like a small road (small balconies, fake windows, trompe d’oeil). What about mblo’? it was a given nickname of a meritourius fondi’s citizen. perhaps it is not a proper restaurant, enzo says. It is like staying at home. The good thing is that it is all true: the menu’ exists but the real one is enzo’s. food depends on the local market, fish and stuffed calf. There are only six things which you will never find at the restaurant: whipped cream, butter, bechamel, bass and gold fish. Enzo and maria loreta, who is the best interpreter of the local cuisine do not like to waste their best selection of regional dishes. Fondi is not very far from the sea but it is closer to a small lake. Not even the hills are that far and the land is rich in fruit and vegetables. A priviliged spot due to its appetizers: little onions with pees, prawns, zucchini, marinade anchovy, smoked cheese and spiced sausages. Variety of simple and perfect tastes. Also the main courses: (“paccheri” with octopus and olives from itri, wrongly called from gaeta, enzo specifies, spaghetti with clam, soup with chicory, pumpkin, beans) are on the top. Small squid, isle of ponza’s little lobsters, snails, frogs, tripe with mint, wild ducks, lamb in the owen, handmade cakes and sweets, are all prepared by maria loreta.